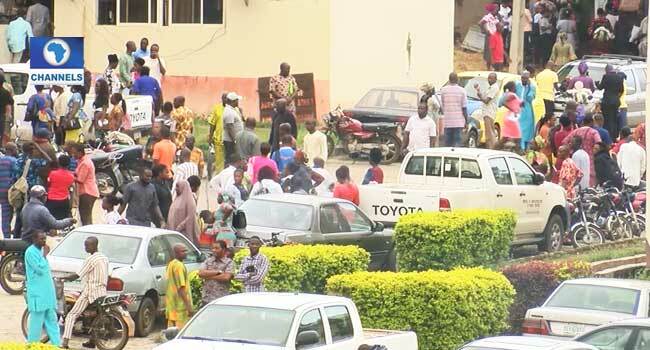 A group called the Ekiti State Workers Rescue Team on Thursday stormed the state secretariat and prevented workers from going about their duties. According to the group, the action was a protest over the workers’ unpaid salaries. Also, the group accused labour leaders of failing to protect the interest of the workers and improve their welfare. But the leadership of the Nigeria Labour Congress (NLC) in the state condemned the move. The NLC Secretary, Olayemi Patrick, who spoke to Channels Television, rejected the claim that it had not taken the workers’ welfare seriously. He said contrary to the claim, the NLC had been engaging the state government on the welfare of workers using an approach it considered best. The state Head of Service, Gbenga Faseluka, was also displeased with the move. He condemned the inability of the police to stop the protesters and subsequently asked the workers to return home until the issue is resolved.